Ever since I graduated in Horticulture I have been getting questions about plants and their maintenance from friends and colleagues. That is what I want, but it sometimes gets old when the same questions are asked every year. Now what about my spireas? a coworker asked me yesterday. Can they be cut down now? Yes and no. It all depends on the type you have. There are two types of spireas: Old-fashioned and Compact. 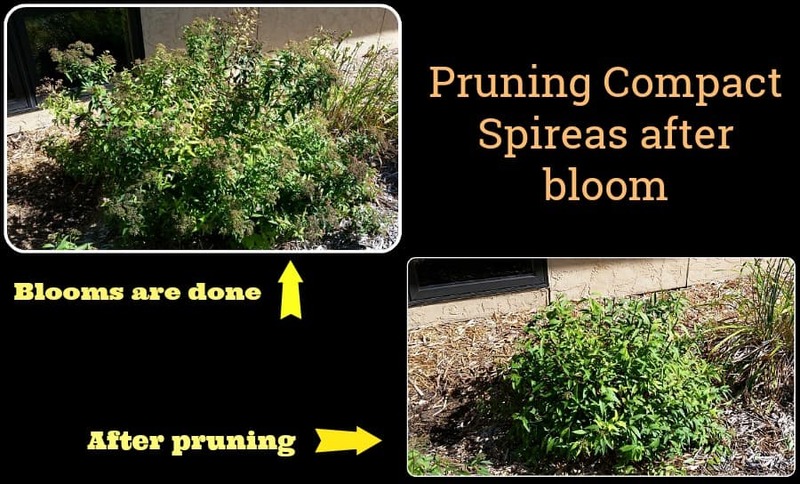 Old-fashioned spireas may contain several species of spirea, including S. x vanhouttei, S. thunbergii, S. prunifolia, and S. betulifolia (also known as Vanhoutte, Thunberg, Bridal Wreath, and Birchleaf respectively). These spireas bloom on the previous season’s growth, meaning that the flowers are borne on wood grown the year before. These types should not be pruned to shape until after they are done blooming. If you are wanting to completely rejuvenate them, then cut them down to 6 inches tall in late winter (February or March). If you desire to have the blooms, wait to prune them, then cut back by one-third to two-thirds. Cultivars include ‘Renaissance’, ‘White Frost’, and ‘Glow Girl’. Compact spireas include S. nipponica, S. japonica, S. x bumalda, and S. albiflora. These are commonly referred to as Snowmound, Japanese, Bumald, and Japanese White spireas respectively. These compact spireas bloom on new growth, so they should be cut down in late winter or early spring, to 6-10 inches tall, depending on the size they were previously. You can use hedge trimmers, a trimmer with a stem blade, pruners, or just mow them off if possible. After the old stems are removed, stomp on the plant to break off dead stems, then remove with a rake. Newer varieties may have some rebloom characteristics, but the following cultivars should be pruned again after flowering by one-third, to promote late summer flowering. Cultivars include ‘Anthony Waterer’, ‘Goldflame’, ‘Crispa’, ‘Little Princess’, ‘Magic Carpet’, ‘Double Play Series’, ‘Neon Flash’, and ‘Golden Elf’.